Remember the green eyed girl who took internet by storm? Well, she has been arrested and charged with making fake CNICs. 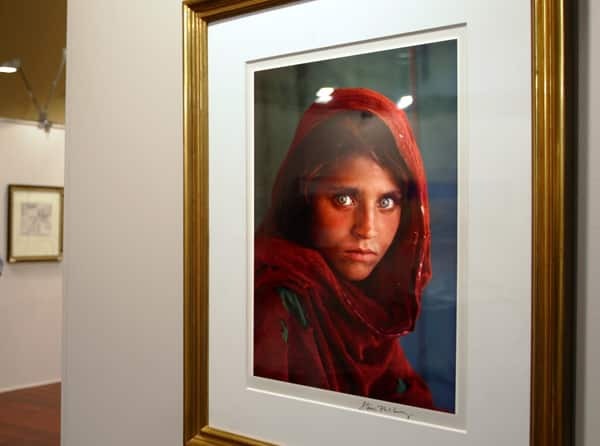 Sharbat Gula became the iconic “Afghan Girl” after her portrait was captured by Steve McCurry at the Nasir Bagh refugee camp situated on the edge of Peshawar in 1984, which appeared on the National Geographic’s cover page in the mid-1980s. Sharbat Bibi’s portait displayed in a New York fine art’s gallery. It was reported that NADRA officials helped Sharbat Bibi in acquiring the Pakistani CNIC. Investigation was conducted and in 2015, FIA also arrested Arbab Rizwan, who was Assistant Director of NADRA at that time. He was accused of helping Sharbat in attaining fake CNIC along with two of her brothers. “This is one of the thousands of cases which was detected last year and sent to the FIA. We are waiting for the findings of the inquiry,” Faik Ali Chachar, spokesman for the National Database and Registration Authority. It was reported that up to 22,000 refugees may have illegal identification. It is estimated that as many as 2.5 million Afghan refugees remain in Pakistan, although many returned to their home after the Taliban regime was overturned in 2001. Over the course of the years, each little step has moved the Pakistani officials closer to the arrest of Sharbat Bibi. The raiding of her house in Peshawar proved crucial, which was with the NADRA’s help who had been helping FIA after the Arbab Rizwan arrest. Sharbat Bibi was arrested from Peshawar, it was revealed. Arresting innocent women while hundreds of terrorist walk freely. Innocent people like you made even Bin Laden innocent. I have to agree with him here. Maybe she wasn’t innocent, but she’s pretty much harmless. Terrorists however, the one’s who our agencies should really be going after instead of chasing these low level crooks, are the real enemies of the state. Yet they walk free. You can not deny little offence by giving example of bigger ones. Crime is crime thats it! You do realize that these fake CNICs can be used by the terrorists? Fake Cnics don’t kill people. Easy access to weapons do. Go after the root cause. But they do. The people who illegally cross our border use Fake CNICs to roam around in the country, and quite often, these people turn out to be terrorists. Seriously? years wasted to catch harmless woman is justifiable? “Remember the green eyed girl who took internet by storm?” Excuse me internet didn’t exist back then..
Our first priority is to catch easy targets. Those who looted billions or killed hundreds are still free because WE dont want to catch them. Seriously? years wasted to catch harmless woman? She’s harmless only if ahe didn’t involve in any ‘activity’. If she did that only to live here then wasting time on her is gonna cost more lives (leaving real killers loose while chasing her). This govt is filled with incompetent people thoae who dont even know what they had to do. Well fake IDs are against the law and she and her accomplices should be punished as per law. Pro Pakistani, does it make sense,32years gone and she still the same as she was in 1984? stop spreading such haox news. which parallel universe is the author talking about. 1984 & internet ? Well, Internet existed in 1970s. Protocol like FTP existed since 1971. And I think writer means “took internet by storm” because she was famous for National Geographic documentary about her about 10 years ago.